EzyDog provides the training leashes you need for your training class or one on one sessions with your dog. These unique leashes are part of a unique collection of training products such as the Checkmate Collar and our Snakpak line of treat bags. The training leashes are an excellent tool to begin training with your furry friend. 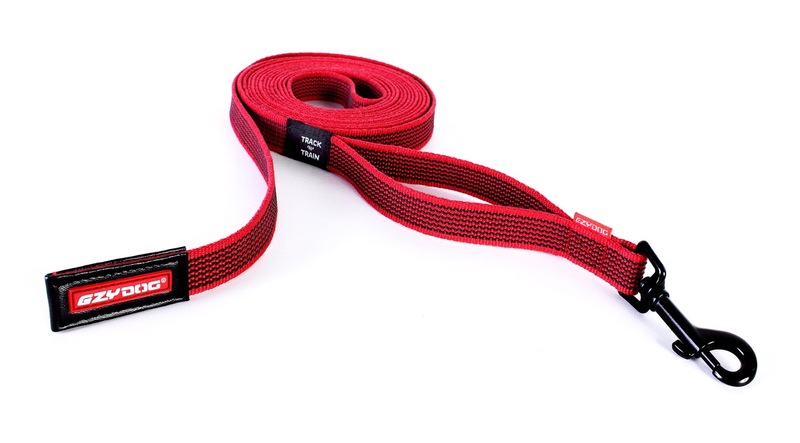 The Track ‘N’ Train Leash is a 16 foot leash with ultra-grippy rubber Lockgrip™ webbing. This webbing make it a cinch to quickly and comfortably grab and hold onto. The anti-snag handle is designed without an end loop to prevent snagging. This is the best leash to teach your dog to respect walking freedom while still having control. The Mongrel and Neo Mongrel are EzyDog classics. This short traffic leads are the best tool for keeping your dog right next to you at all times. This is perfect for heel training and in tight situations. The Vario 4 Leash is our most popular dog training leash with its’ three different lengths that can all be adjusted simply while never taking the leash off of your dog. From 6 to 3 to 2 feet all on the fly, it is a simply brilliant leash that has become a staple of many training classes. Pair this with the Checkmate Collar and the Snakpak Treat Bag to become the most prepared trainer on the block. With a variety of options to choose from you can find the training leash that best suits you and your dog’s needs. From the seasoned trainer to a complete novice these leashes are designed to help you get the most out of the time spent during training sessions with your dog.